Antonio Barluzzi is known as an architect but for many years he thought about entering a seminary. It was on the advice of his spiritual mentor and encouragement of his older brother Giulio, already an architect, that he entered the engineering school at university to study to become an architect. After graduation and his army service he worked with his brother on several architectural projects in Rome. By 1910 Turkey is described as the “sick man on the Bosphorus” and all the European powers were staking their claim to pieces of the Holy Land. Schiaparelli of the Italian Missionaries Association hired Giulio to design and build an Italian hospital in Jerusalem with substantial financial aid from the Italian Ministry of Foreign Affairs. Guilo is overloaded with work and probably prefered Rome to Jerusalem so he sent Antonio. Schiaparelli recommended that “in the new building, a worthy chapel should have a place of honour, which can accommodate, in special circumstances, the Italian colony”. 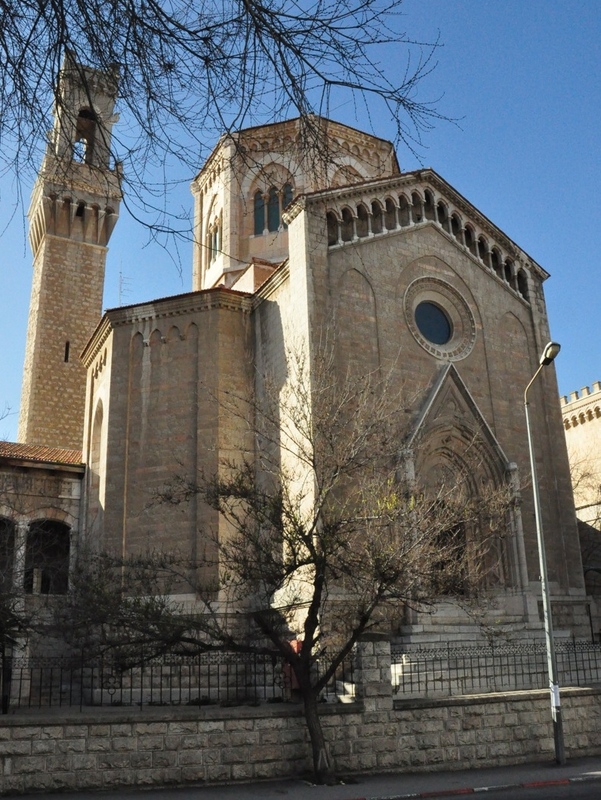 He also suggested that it be named Santa Maria Latina in memory of the old church of the Amalfitans in Jerusalem (today the Crusader part of the German Lutheran Church in the Muristan). So Antonio designed the hospital, definitely Italian looking, a curious mixture of the Palazzo Vecchio on the Piazza Signoria in Florence and the tower of the Mangia in Sienna. With the outbreak of the First World War Barluzzi left for Italy and entered a seminary and stayed for 40 days, then Italy entered the war and he was called up. Italy allied itself with Britain, Barluzzi was recommended to the Ministry of War as an expert on the Holy Land and so on December 11, 1917, our architect entered Jerusalem on foot through Jaffa gate together with General Allenby. In 1978 while studying in Israel I took some photos of the Old City with a Nikkormat SLR camera using black and white film. One photo in particular I liked quite a lot, a pastoral scene just across from Damascus Gate looking north, of a young Arab boy shepherding four goats in a field. In the distance, framed by two trees is an Italian looking building. Of course, today the field is gone but the building is Barluzzi’s Italian hospital, his first building in Jerusalem. The question was where would I find that photo from 30 years ago. I started looking through shoeboxes of photos and after about 10 minutes in a box with old letters, lo and behold found the negatives. I took them to be developed and a few hours later had prints of the photos. 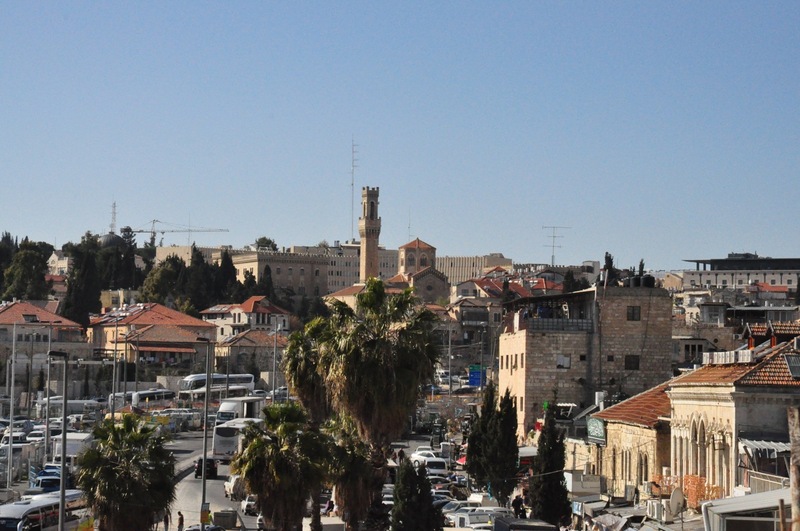 I shot a similar view the other day from the ramparts at Damascus gate. From there I walked over to the chapel – the Italian hospital buildings are being used by the Israeli Ministry of Education. Unfortunately the chapel is not open to the public. Barluzzi was asked to build two churches by the Franciscans, on Mount Tabor and in the Garden of Gethsemane. He returned to Italy to ponder his future. He wrote in his diary: ‘I go to Father Corrado, the confessor of my youth, I explain my circumstances and ask what I must do. ‘Go and build the Sanctuaries, and then we’ll talk again.’ My heart leaps for joy, and I say: ‘It is Gods will’. 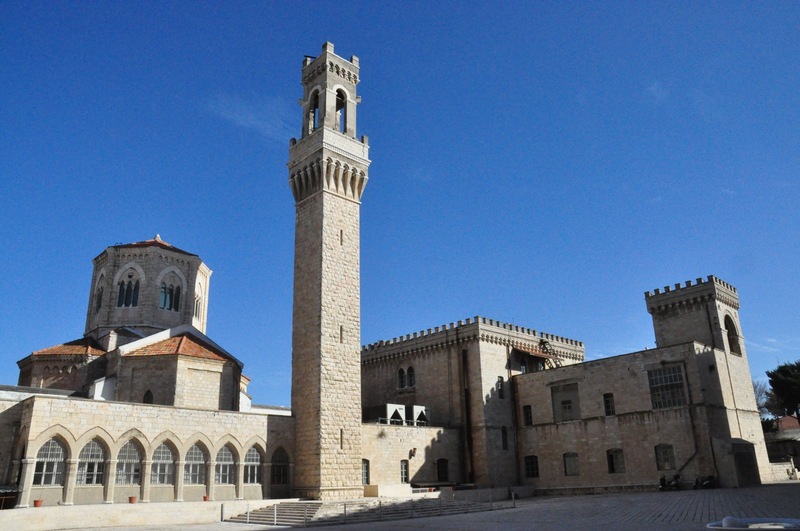 So Barluzzi began to build a basilica on the top of Mount Tabor, one of the traditional sites of the Transfiguration. This was a challenging task in 1919 because there was not even a road or water, which had to be carried by mules; even the stone masons were brought from Italy. Again Barluzzi borrowed from an existing church, St. Simeon the Stylite near Aleppo, for his design because of the importance of the Transfiguration in the Syrian liturgy and the triple division of the facade matched the three figures in the story, Moses, Jesus and Elijah. The roof was originally of alabaster tiles in order to let the light in, unfortunately these had to be covered to prevent the rain coming in but Barluzzi used the element of light to the full. At the same time he was working on the basilica at Gethsemane, called both the Church of All Nations and the Church of the Agony. Here Barluzzi developed his symbolic architecture, in this case Christus dolens et triumphans. The suffering of Jesus and his pain is represented by a building of Byzantine inspiration which evokes the beginning church, a somber interior of dark mosaics with the light filtered by purple glass, with twelve small domes, like the apostles. The glory is the triumphal facade of classic Roman inspiration, a triple round arch, supported by four large pilasters surrounded by columns topped with Corinthian capitals (a similar capital was found during the excavations and is on display at the Stadium Biblicum archaeological museum). Barluzzi went on to build numerous other churches, transforming into stone the deepest sentiments of his heart and dedicated his life to honoring and glorifying the earthly Jerusalem. It is a blessing to be able to experience his work. Just inside Jaffa gate is the Franciscan Christian Information Center. As of the date of this post, there is an exhibit about Antonio Barluzzi that I highly recommend. This entry was posted in Architecture and tagged architecture, church, Franciscan, Gethsemane, Mount Tabor, postaweek2011 on February 25, 2011 by Shmuel Browns. Have you read my web feature on Barluzzi, one of the few extended articles on him? The buildings are the pilgrimage churches of the Holy Land at places like Gethsemane, Galilee and Mount Tabor – and Antonio Barluzzi was their architect.